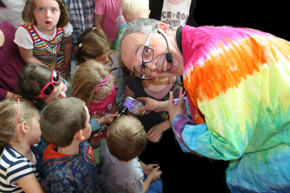 Our Mad Professor fun scientist parties will delight your 7 to 70 year old children with great fun science for kids all over Ireland. Watch your children learn about air and sound, visual puzzles, density and oil and water, along with the amazing manufacture and release of various gasses (mostly pleasant)! 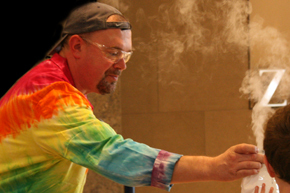 Learn how make slime and goo and watch a volcanoe erupt, bottles explode, small plastic boxes fly skyward and coke spray 20 feet into the sky (outdoors naturally - if it's raining the young professors can stay indoors!). We have both educational and fun experiments that will have your children laughing, entertained and educated for 60 minutes. 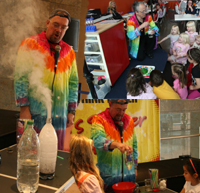 Our fun scientist mad parties will spark that imagination with our mad and educational programs and activities. We explain the factuals and involve as many of the children as possible over the course of the show. This "spark" is of more importance in 2011 - see the quote from the Irish Times at the bottom of this page. Many of the experiments consist of material found at home, so the children will then have the knowledge - so parents be warned! Our parties are growing in popularity, so if you require any further information please call Professor Noddy (Niall) on 087-2700978 or use our enquiry form here. Many thanks for dropping by. Check out our science party invitation downloads on our prices page. Have a look through our site as we have slideshows showing some of our mad professor fun scientist experiments - on most pages. You can check them all out on our gallery page. Check out our Mad Professor fun science party testiomials here. Copyright © 2011 Really Grand Events. All Rights Reserved. Designed and Search Engine Optimised by SeoWebsite.ie.